LONG RUN BIDS tomorrow to regain his King George VI Chase crown which he won so impressively two years ago but to do so he must rediscover the form he displayed then. Long Run – trained by master handler Nicky Henderson – looked as if he was going to dominate the chasing scene for years to come when he won the King George at the astonishingly young age of six and then went on to capture the blue riband of the jumps, the Cheltenham Gold Cup. However, last season put a dampener on that notion, winding up with a limp defence of his Gold Cup crown when he finished a well beaten third behind Synchronised, who tragically was killed in the Grand National a month later. With him gone and the legend Kauto Star retired – and controversially sent to be transformed into a dressage horse – Long Run will take on nine rivals at Kempton Park in what is effectively the mid-season steeplechase championship. He comes into the race on the back of finishing second behind Silviniaco Conti last month in the Betfair Chase – the same race he was beaten by eight lengths by Kauto Star last season – but Henderson believes that he is in the right form to win. “Everything has gone right. Haydock went much better this year than it did last year, probably thanks to no Kauto Star to thump him,” the 62-year-old told At The Races. OK, we got beaten, but he ran well and was probably straighter and didn’t get quite as hard a race. He improved dramatically from last year’s Haydock race to the King George. 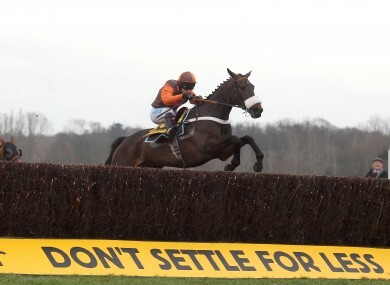 We only got beaten less then two lengths by Kauto instead of eight. We’d expect to find that improvement, and I’d be hopeful that the ground is the one thing that can play to his strengths. Everything has gone well, the schooling has gone well and his work has been great. “I think he goes in there with as big a chance as he had two years ago and we’d like the same again,” added Henderson, who also saddles Riverside Theatre. Among those hoping to prevent a repeat of his 2010 victory will be the surprise Gold Cup runner-up The Giant Bolster, who was third in the Betfair and due to be ridden by Tony McCoy, and Captain Chris, who was third in the King George last year. “He’s flying, in tip-top condition,” said The Giant Bolster’s trainer David Bridgewater. It was a superb run at Haydock and he’s come on a bundle from it. I’m getting very excited about the race. David Pipe has two in the race, Grands Cru and Junior but perhaps the most interesting contender is Kauto Star’s half-brother Kauto Stone, who will sight his stellar relation as he is due to be paraded before the race. His trainer Paul Nicholls says there is little similarity between the two brothers. “There aren’t any similarities with Kauto Star. He’s half the size, he’s a different colour and has a different profile. Email “Long Run looks to regain lost lustre”. Feedback on “Long Run looks to regain lost lustre”.